Shortly after that first prehistoric cookout, someone must have noticed that burning different woods created different flavors in food. Some flavors were good and some flavors were not so good. Of course, we know that hardwoods, like oak, hickory, and mesquite and fruit woods, like cherry, apple or even pecan are much more desirable for making smoke. When you slow smoke a piece of meat you give it plenty of time and smoke so that it can absorb the flavor of the smoke. However when you grill foods there isn’t a lot of time to introduce smoke to the food. The first rule is not to waste your time and wood on things that simply won’t benefit from the smoky flavor. Typically these are foods that cook quickly. Case in point, the charcoal versus gas argument. Taste tests show that while the average person can tell the difference between steaks cooked over gas versus steaks cooked over charcoal, they can’t tell with a hamburger. Reason? The hamburger doesn’t spend enough time on the grill to pick up enough of the smoke and flavor produced by the burning charcoal. So, soaking wood chips for a hot dog cookout is probably a waste of time and wood. However, if you are grilling a leg of lamb or a prime rib roast then go ahead and get the smoke going. Do you want to use wood chunks to make smoke if you use a charcoal grill? If you are using the standard, off the shelf charcoal briquettes, then yes you do. If you go the extra mile to find lump charcoal then probably wouldn’t need the extra smoke, unless you like it that way. To add extra smoke to your grilling start by placing your hardwood chunks in water. The wood should be saturated with water but not dripping wet when you add it to the fire so once you remove it from the water, let it drain until it stops dripping. If you are using a charcoal grill you can add the wood directly to the coals once the fire has died down. Always add smoking wood when you are ready to cook. There’s no point making smoke for the sake of smoke. If you are adding smoking wood to a gas grill then you need to arrange to keep the wood isolated from the fire. You don’t want the wood to burn too fast and you don't want the ash to collect in your gas grill. 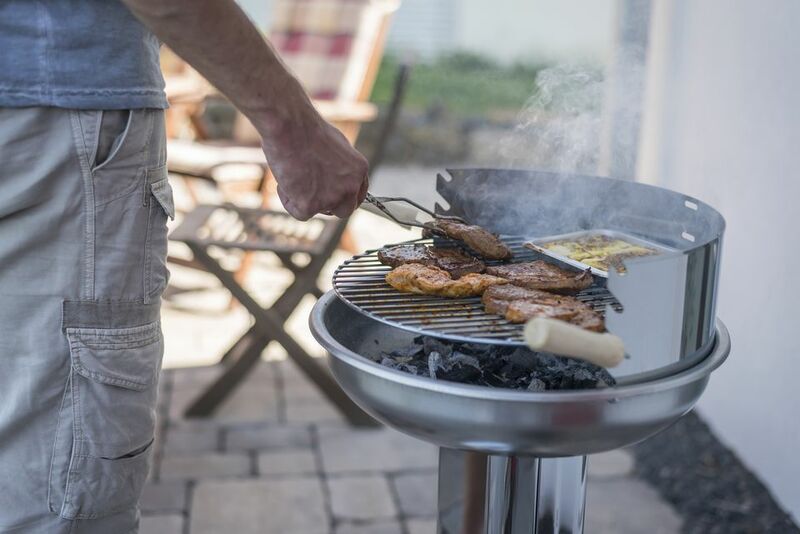 There are several devices on the market for holding smoking wood chips in your gas grill; the most common is a cast iron box that fits under the cooking grate and above the burners. However, the easiest and cheapest unit is a sheet of foil. Take your soaked wood and place in on a piece of foil, fold to enclose it and then punch a couple holes through the foil to let the smoke through. This method works great and all you have to do is throw out the foil packet once it's cooled down. The great thing about cooking with smoke is all the experimentation it allows you to do. There all kinds of different woods you can use in different combinations. I suggest you start with oak, it’s a good mild wood that won’t overpower your cooking and will get you started on the journey of cooking with smoke. Good luck.